Day one of Phi Phi ended with us bumping into into our new found Manchunian friends from the Phuket to Phi Phi journey. We stayed up late, danced on the beach and skipped a rope of ACTUAL FIRE! Yep, seriously...it happened! Surprisingly day two started bright and early with a little nap on the beach before heading to the Pirate Bar and Restaurant for breakfast (we also ate here last night - pizza and salad as we fancied a change from rice/curry/noodles.) 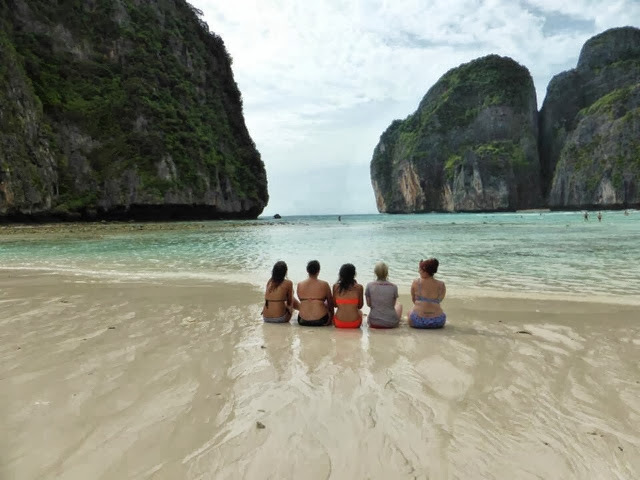 The previous day we booked for the trip to Maya Bay (the infamous setting of the beach) which included snorkelling, monkey island, an hour in the bay and, most importantly, lunch! 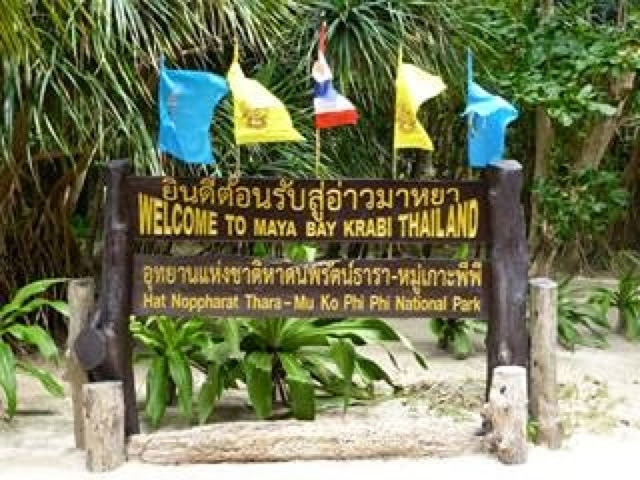 This trip cost us 400 baht (which included a discount of 100 from the original 400, but included a 100 fee for Maya Bay. Would I recommend it? Definitely! The crystal blue waters, soft sand and sheer 'wow' factor of the place are enough for me to tell anyone 'you need to go'. Perhaps I would think differently had we gone in peak time - right now it seems to be downtime in Thailand as most countries and back at university. I'm not sure I would want to go in peak season as it's renowned for being packed and I'm not sure you would appreciate the beauty of the place. We were allowed an hour to admire, take pictures and go in the water before having to brave the treacherous rocks again! After we'd make it back to the boat, injury-free thankfully, we sailed a little further round the island to do some snorkelling. 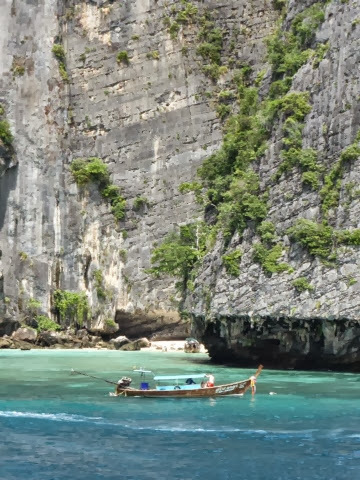 The water and views are just incredible; it really is one of those moments you realise how lucky you are when you see the area surrounding Maya Bay. We snorkelled for around an hour and saw beautiful fish - even Nemo! I'm normally terrified of fish which means snorkelling is a 'to avoid' activity for me but my motto for this trip is 'be more daring and try everything' (within reason Ma and Pa, don't panic!). So I braved and and jumped in feet first (literally), armed with my snorkel. Im glad I did; there were so many pretty fish to see. Unfortunately, it was a little bit shallow so I scraped my knees a few times but we had been informed of that back at Maya Bay. After snorkelling, we were shown to Monkey Island - something we actively avoided. Everybody knows monkeys are slightly dangerous, but primarily, little buggers! They always steal things and turn nasty when they don't get what they want - spoilt kids! This trip did include seeing the sunset but unfortunately it was that overcast we wouldn't have seen anything too spectacular so we made out way back to Phi Phi for a much needed shower! We headed back to the hostel, showered and had a quick lay down after a rather strenuous day (you'd be surprised how much the rock climbing/rope hoisting experience wore us out!). That night we headed to a place called Pum, a cute little restaurant on the opposite side of the beach to our hostel. As well as a restaurant, Pum is also a cookery school, offering a variety of classes. They even had their own merchandise so I'm guessing it's pretty popular in Phi Phi, and, I understand why - the food was incredible. 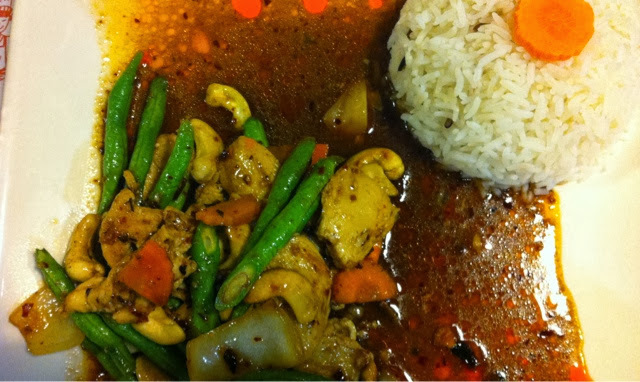 I opted for Cashew and Chicken with vegetables and rice. There was also soup and chicken fried rice ordered too which were equally as tasty. After food, we were all pretty exhausted so slowly made out way back to the hostel for an early night ready for the trip to Koh Phangan tomorrow! And this island would mean VERY little sleep because of the infamous Full Moon Party! Exciting!